Salad is a great thing to send for lunch, but let’s face it — not every kid is SUPER excited about it. It’s also not the greatest “mini-meal,” since it requires cutlery and isn’t easy for little ones to pick up and munch on. Or is it? When I was working in the non-profit sector, more than once I attended fundraisers where one of the popular appetizers was a hand-held version of a Caesar salad. I’ve taken that concept here and made these salad spears, which could be built in sturdy Romaine leaves, as I’ve done; or in the hollow of stalks of celery; or in seeded cucumber boats. The important thing is that the vehicle you choose for your salad spears should allow the kids to pick everything up all together if they want to, and dip it into the dressing of their choice. The advantage to using romaine lettuce is that you can trim it so that there’s enough of the leaf itself left on the sides to wrap around the salad filling, making it a neat little package to dunk. 2 tablespoons dressing of your choice — I show it here with homemade honey-mustard dressing, which is just 2 parts honey to one part dijon mustard and one part olive oil. 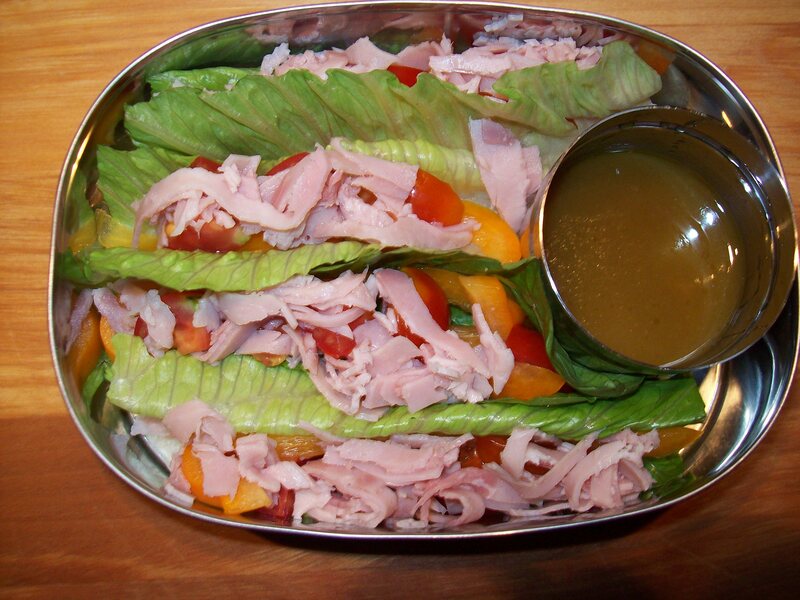 Assemble the salad spears by arranging the romaine leaves in the lunch container of your choice — it’s preferable if you can pack them pretty tightly together so they don’t wiggle around much. Lay the julienned vegetables in the hollows of the romaine spears. Top with the diced tomatoes and cucumbers, then sprinkle the meat and cheese, if using, over the top of the spears. Serve with dressing for dipping.